Forty-one airline companies operating in the Philippines have signed a Memorandum of Agreement (MOA) with Manila International Airport Authority (MIAA), Wednesday, March 15, 2017, to totally abolish terminal fees paid by Overseas Filipino Workers (OFWs). Speaking of the event is Transportation Secretary Art Tugade who relay the message of President Rodrigo Duterte to OFWs and also to airline companies. Tugade said scrapping terminal fee is a big help to OFWs. Also, this will manifest President Duterte's love and concern to our modern day heroes. Through Tugade, Duterte also gives thank to all airlines who give heed to the calling of Department of Labor and Employment (DOLE) to stop incorporating terminal fees in airline tickets of OFWs. It was last March 3, 2017, when DOLE Secretary Silvestre Bello III ordered Civil Aviation Authority in the Philippines (CAAP) and airline companies to stop the illegal collection of terminal fees and travel tax from OFWs. Bello reiterated that OFWs should be exempted in paying travel tax and terminal fee pursuant to Presidential Decree No. 1183, Republic Act 8042 or Migrant Workers Act and Overseas Filipino Act of 1995, as amended by Republic Act 10022. 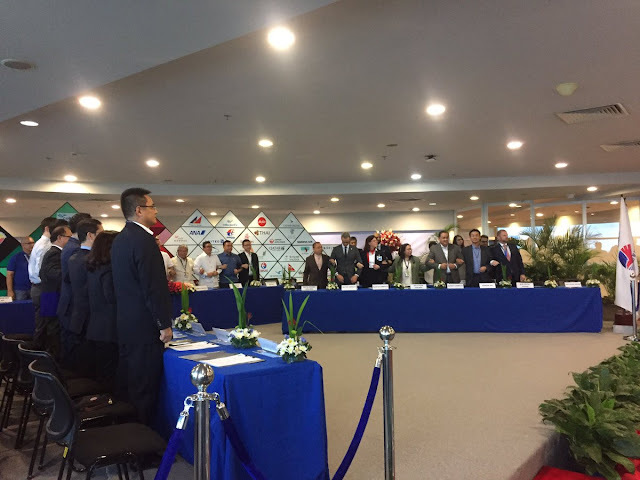 Here is the list of airlines that operates in the Philippines and has signed a memorandum of agreement together with MIAA to abolished terminal fees. The implementation of the MOA will take place on April 30 this year which means that when an OFWs buy a ticket starting the said date, he or she will no longer be charged P500 terminal fee. Earlier the Emirates airline confirmed that they will comply laws in the Philippines concerning migrant workers. It is confirmed by a spokesperson of the UAE-based aircraft that expatriates from the Philippines will no longer have to pay for extra aviation fees when they book flights with Emirates Airlines. It means, Filipinos won't be obliged to pay the local travel tax and terminal fees. This is an equal to P1,620 or Dh118 per economy class passenger while airport fee can cost P750 pesos (Dh55). To avail such exemptions, OFWs should present their Overseas Employment Certificate (OEC) at the time of booking or prior to departure. The P550 terminal fee that is being integrated with the air ticket purchased by the OFWs will no longer be charged starting April 2017. 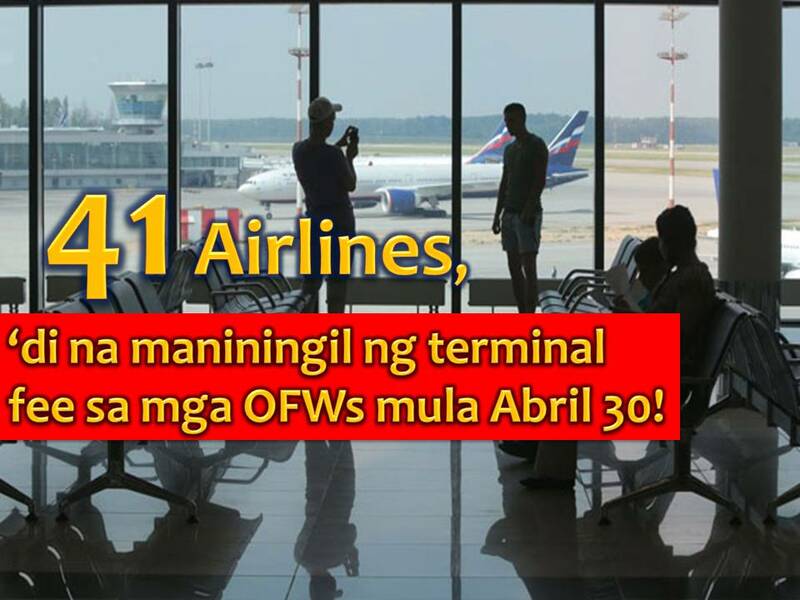 This is a promise made by MIAA General Manager Ed Monreal to the public and to the OFWs as a response to the request of President Rodrigo Duterte to lift the burden of the OFWs shouldering the terminal fee whereas the law stated that they are exempted to pay such fees.That was according to the news dated November 29 last year. This year, that promise is about to be fulfilled in just a matter of days. The Department of Labor and Employment (DOLE) is asking airline companies particularly the Civil Aviation Authority of the Philippines (CAAP) to implement the exemption of Overseas Filipino Workers (OFWs) in paying travel tax and terminal fee.In his letter to Captain Jim C Sydiongco, director general of CAAP, DOLE Secretary Silvestre Bello III, reiterated that OFWs should be exempted in paying travel tax and terminal fee pursuant to Presidential Decree No. 1183, Republic Act 8042 or Migrant Workers Act and Overseas Filipino Act of 1995, as amended by Republic Act 10022. 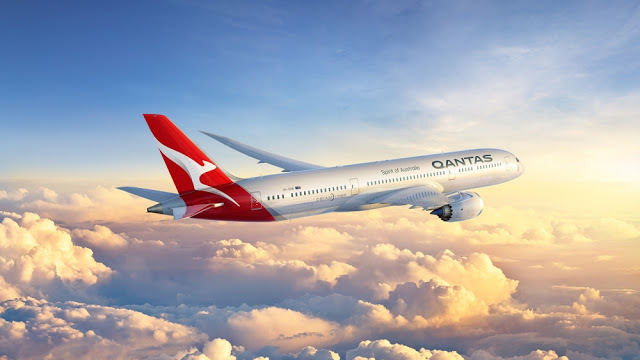 For the fourth year in a row, Qantas Airline from Australia has been named as the world’s safest airline by AirlineRatings.com, the world’s only safety, and product rating website.